The music of the French composer Pascal Dusapin was first introduced to me back in 2003, when as a response to a friend’s recommendation I bought a disc of concertos on Naïve (MO 782153). The highlight of that disc for me is Celo, Dusapin’s cello concerto of 1996. His music will be in the limelight later this year when his new cello concerto is performed at the BBC Proms. This is a disc I have enjoyed over the years, but I have never gotten around to exploring his music further, despite a number of high-profile releases in the intervening years. Born in Nancy, Dusapin studied with Iannis Xenakis and Franco Donatoni, and is an admirer of the music of Edgar Varèse. Even so, he largely rejects electronics, percussion and keyboards in his own music, despite himself being an organist and jazz pianist. He was introduced to me as the “musical heir to Messiaen”. I had a problem with that: his music is very individual and not at all like the older composer’s. If anything, his earlier music showed an influence of his teachers, although this was not obvious. It was more in his use of microtonality than musical homage. But I now see what my friend was talking about, in that Dusapin now occupies the place that Messiaen once did. This two-disc set presents Dusapin’s works for solo cello, all but one of which, Imago, were composed prior to the early cello concerto. These strongly individual pieces display Dusapin’s understanding of the limitations of the instrument. He composes for both extremes of the cello, calling on the performer to play notes one might not have thought possible to achieve. The same could be said of the two pieces for solo clarinet presented here, If and Ipso. I do prefer the two works for the unusual combination of cello and clarinet, Laps and Ohé. The composer seems a little more comfortable writing for combinations of instruments (I prefer his concertos disc). That being said, his solo music is strong and interesting. The pieces are arranged chronologically. For me it is the music after the eponymous track which holds the greatest interest. I find it the most individual. The clarinet piece has an almost oriental flavour to it. The same can be said of the first work of the second disc, Immer, the opening bars of which have a hint of the Arabia about them. Again these influences seem subliminal rather than implied. It is how these aspects of the music are developed which is the interesting part of Dusapin’s writing. 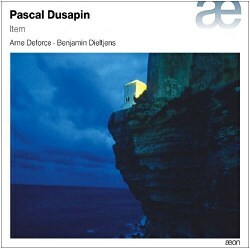 This is not easy music to listen to or (I imagine) to perform, but Arne Deforce and Benjamin Dieltjens are its excellent exponents. Theirs is a nuanced performance, one which brings out the aspects of Dusapin’s writing. This has been an enjoyable listen, although some might find listening to both discs consecutively a little daunting. Excellent recorded sound and booklet notes make this a most valuable release.